We pride our business on high quality audio. We have the latest digital and analogue recording equipment to capture every subtle nuance of our clients musical performances. The Audient 8024 high resolution mixing console is at the heart of the studio, adding warmth and colour to the audio signal. Pro Tools HD1 recording system, mutli-tracks, processes and stores all the audio. Great recording equipment requires great musical instruments. We have them too! A beautiful set of Yamaha birch absolute custom drums are centre piece of the live soundrooms. Add to them a large selection of top quality microphones and a fabulous drum sound is guaranteed. Marshall, Fender, Peavey and Roland amplification both value and solid state, give guitarists and bass players every possible option. When it comes to controlling, processing and effecting your audio, the control room has all the latest features. Full parametric Eq on both the Audient and Pro Tools. Loads of TDM plugins from Waves, Bombfactory, Joe Meek, Focusrite, Digidesign, Trillian Lane and Tech 21. Pitch correction software is the industry standard Antares autotune evo TDM. Just an amazing program! 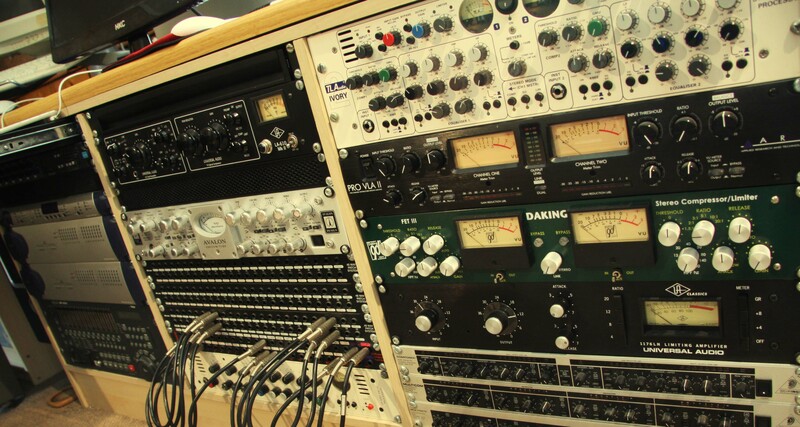 We have had many years experience mixing and mastering audio material. From complex 40 to 60 track monster mixes to simple vocal, backing track songs. Mastering or finalizing your tracks is all about level these days, we do try our best to preserve the dynamics while not leaving the audio material under powered. Not forgetting our classic analogue multi-track tape recorders. Studer made the finest open reel tape recorders in their day, these machines have a sound all of their own. Many studio clients will use nothing else, pure quality audio, big fat sound and super cool tape saturation. Nothing comes close! 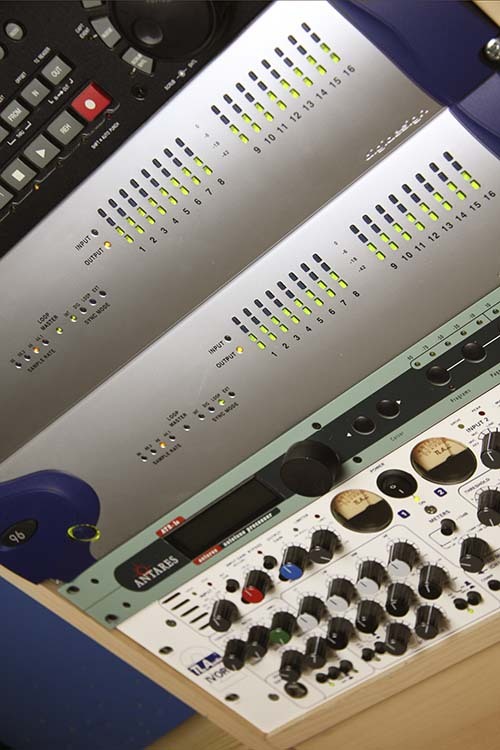 Digidesign Pro Tools HD recording systems. The Pro Tools hardware and software is controlled from a Mac Pro 8 core intel computer. Loaded with plugins and effects. Studer A80 analogue 24 track tape recorder. Beautiful warm 2" analogue tape recorder. That classic tape sound big and fat! A fine collection of quality condenser and dynamic microphones. Neumann, AKG, Beyer, AudioTechnica, EV, Shure, Sennheiser, Behringer. High Resolution Mixing Console. 36 channels 24 bus and 12 aux send. The Audient 8024 is the centre piece of the studio, offering flexibility and control. We now offer a full CD duplication service. High quality audio copies, onbody CD disk full colour printing. CD jewel cases or plastice wallets. Full artwork service available, or use your own artwork most formats covered. Great for selling at gigs, promotion and handouts to fan base. See read more for pricing. Pro Tools HD1 Recording System. The Digidesign HD PCI Pro Tools 7.4 HD Core System is the industry standard for recording artists, processing audio, composing music, overdubbing film, mixing tracks and design and editing sound. The Digidesign HD PCI Pro Tools 7.4 HD Core System with the award-winning Pro Tool HD 7.4 Software, a powerful bundle of professional virtual instrument and sound processing plug-ins. Also dedicated DSP that installs into your computer to provide processing power in TDM/RTAS format. State of the art digital recording. Pristine analogue to digital convertor. 96khz 24bit sample recording rates. 32 analogue inptus and outputs. 96 audio tracks and 256 midi tracks. 9 DSP processors for limitless plugins. Apple Mac Pro 8 core intel processor controlling hardware and software. Pro Tools Sync word clock and smpte timecode generator. Antares AutoTune Evo TDM industy standard pitch correction software. Loads of TDM and RTAS plugins. Digidesign, Trillian Lane and Tech 21. Virtual Intruments Moog, Arturia, ARP, Korg. We have two Studer A80 open reel tape recoders at Whitby Studios. The main recorder is a well maintained A80 24 track 2 inch Mutli-Track. Running at 30ips it is the Roll Royce of tape recorders, no sample rates here, it records everything! The Studer also feature the Autolocate and Remote, so operating the machine is a breeze. With 24 and 16 track head blocks every tape format catered for. We also have a great 1 inch 8 track machine, which can still be used if required. These machines are great for recording drums acoustic and electric guitars. Vocals work really well limiting the need for compression. Tape saturation is a unique sound and no plugin or outboard processor sound anything like it! The Studer A80 locks to Pro Tools via the Pro Tools Sync unit. Its uses smpte to position the playhead and the Sync unit converts the incoming timecode to wordclock.So Pro Tools and the Studer A80 are locked up tight right through the whole session. The U 87 is probably the best known and most widely used Neumann studio microphone. It is equipped with a large dual-diaphragm capsule with three directional patterns: omnidirectional, cardioid and figure-8. These are selectable with a switch below the headgrille. 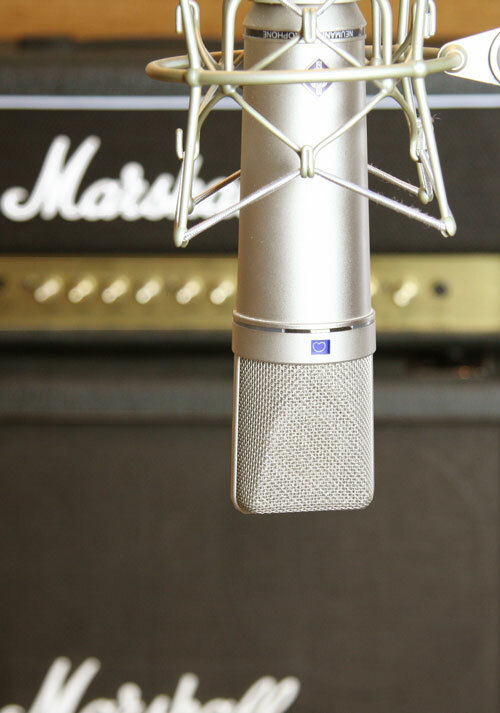 Users recognize the microphone immediately by its distinctive design.The U 87 Ai is used as a main microphone for acoustic recordings, as a spot mic for single instruments, and extensively as a vocal microphone for all types of music and speech. The C414 XLS multipattern condenser microphone offers a choice of nine polar patterns for the perfect sonic capture for every application. A peak hold LED displays even the shortest overload peaks. For live-sound applications and permanent installations, all controls can easily be disabled for trouble-free use. The C414 XLS maintains the sonic character of the legendary C414 B-ULS, the most popular AKG C414 version since 1971. Engineered for highest linearity and neutral sound, it has been the most versatile large-diaphragm microphone for decades. The side-address AT4033a offers low-noise, symmetrical, transformerless circuitry that results in exceptional transient response and clean output signals. A strong up-front presence characterizes the sonic signature of this 40 Series pro-audio classic. The AT4033a's 80Hz high-pass filter easily switches between flat frequency response and a low-end roll-off that diminishes ambient noise and popping with closely-miked vocals. The e602 is a cardioid instrument microphone especially suitable for use with bass drums, bass guitar cabs, tubas and other low frequency instruments. The e604 frequency response and cardioid pick-up pattern are optimized for drum sets and other percussion instrument miking, while also producing exceptional results on all forms of brass and woodwind. An integral stand mount screws directly onto mic stands and included clip attaches mic to rim of drum. Very high sound pressure level handling. A tough reinforced glass fiber body takes the knocks and shocks and suppresses impact noise. The versatility of the C 1000S makes this an extremely popular model, and one ideally suited for all kinds of recording and live sound applications. A powerful, flexible and intuitive console, ASP8024 brings superb audio performance from one of the world's most experienced and successful console engineering teams.Far from a retrograde step, analogue mixing provides the clarity and quality demanded of the best ears in the business for both tracking and mixing stages and ASP8024's future-proof design ensures its continued compatibility and seamless integration with digital equipment.Moreover, thanks to innovative design and construction processes, ASP8024 delivers exceptional audio quality and features. State of the art future-proof performance. 80 inputs in standard 2m long frame. Ergonomic control surface with clearstatus feedback. Unique modular construction for easy serviceability. Integral Compressors on stereo bus. Selection for Main plus 3 alternate controlroom speakers. Separate fader section for flexible automation options. We now offer a full CD duplication service. High quality audio copies, onbody CD disk full colour printing. CD jewel cases or plastice wallets. Full artwork service available, or use your own artwork most formats covered. Great for selling at gigs, promotion and handouts to fan base. See read more for pricing.